Normally, a book of 192 pages would have my attention during random hours over a two-week period; in the case of Brian Martin’s tales of Foleshill Road and Browns Lane 1949-1978, every evening for five days it kept this reviewer totally absorbed. 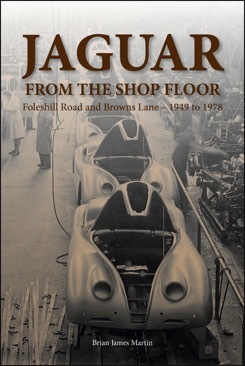 Without giving too much away, this semi-autobiography begins post war when fresh from school Brian joins Jaguar as a general ‘dogs body’ desperate for a future apprenticeship. Many of those early adventures are remembered with a free-flowing wit that continues throughout the book; a Jaguar trip to the Earls Court Motor Show in 1950 and the authors first encounter with a hotdog. His various tasks in those early days included time spent in the trim shop with Gladys and Dorothy whose names can still be found behind the instrument panels assembled during this period. A promise of a return to Jaguar once National Service within the RAF was completed resulted in trying to avoid the so-called production line ‘dirty jobs’ like fitting sound deadening. His electrical/electronic skills acquired in-service continually improved once ‘de-mobbed’ allowing the author to work his way to the forefront of Jaguar development, including new models. A passion for motor sport flourished, especially around Le Mans 24 hours; he was there during the race in 1955 and the tragic accident that shocked the world.